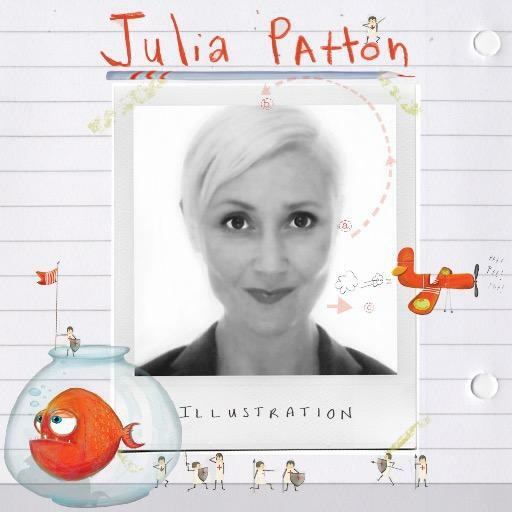 In my last blog post I was delighted to share with you that the very talented Julia Patton is the illustrator for Professor McQuark. I posed her a few questions and I think you’ll agree that, with her hectic schedule, inspired ideas and appreciation for the silly things in life, she is the Professor McQuark of the illustrative world! Looking at your Amazon Author Page, you are a very busy woman! How do you choose your next project? What drew you to Professor McQuark and the Oojamaflip? I am lucky enough to have a collection of dedicated Bright agents in London and New York who work tirelessly for me, internationally sourcing the newest and hottest authors and publishers to collaborate with. Most weeks a few new jobs pop up! I also source my own new publishers through attending the International Children’s Book fair in Bologna, which I visit each year. It’s a lovely break in the publishing calendar to look forward to during the long hours in the studio. I use this annual opportunity to meet face-to-face with existing international publishers, strengthening those all important relationships. It’s a delight to finally meet someone after 6 moths of daily emails (often at very unsocial hours). Attending the trade fairs is important for me to see the worlds finest publishing houses under one roof. I then can see emerging trends, where my work fits into the market and who is on my next wish list to work with. Very inspiring. Networking with a glass of prosecco is also rather lovely! Choosing the next project?….rather more difficult than first anticipated. I’d love to say yes to everything, but it’s is impossible. At one intense period I had 6 books on the go simultaneously. As you can imagine this is not sustainable or really giving everyone your best. A freelance creative has to carefully select what works best for them, everyone works differently. I know illustrators who deliberately take weekends off and others that work flexibly around busy families. Unfortunately these decisions usually depend upon timing: what I’m currently working on, what’s lined up for the immediate months and what I have lurking in the not-so-distant-future. Deadlines vary greatly so calculating what I’m capable of achieving to the highest standards has to be estimated. Saying no to any project is very hard. I also specifically put aside time to write and develop my own stories- I have maybe 4/5 ready to pitch, a few in the pea-pod stage and others just scribbles in my sketchbook that require frequent watering to blossom. I was delighted to be offered Professor McQuark from Maverick Publishing as we’d wanted to work together previously but I’d been too busy unfortunately. Timing. The text was exceptional – if you can visualise each line, word and character on the first read-through you know it’s going to be very special. Exciting, busy and beautifully rhymed! 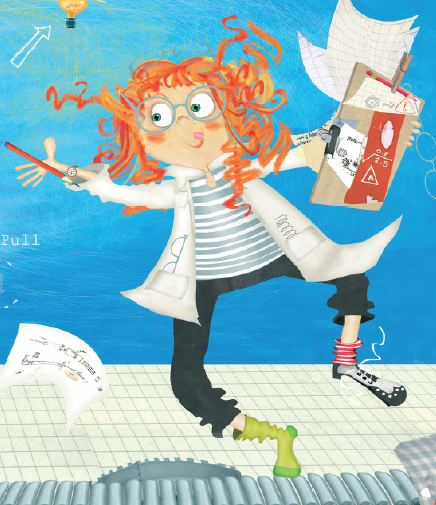 A female professor empowering a new generation of mini-inventors and engineers! YES PLEASE! How do you come up with a look for your characters? For example, I love the fact that the Professor has four pairs of glasses! Character development is important to make each book distinctive, we have to care about our protagonists and this requires creating them with love and attention to detail. A redheaded character can subliminally be seen as the underdog we all secretly champion and we all can imagine what adding copious amounts of freckles to a little boys’ nose can possibly achieve!!! Professor McQuark is so clever and busy that she’d obviously require numerous spectacles and it was also a reference to my childhood hero, Professor Branestawm, who had multiple glasses too. The level of detail in the illustrations is amazing! Were you a Richard Scarry fan when you were younger? Who inspired you? I believe my role a s an illustrator is to illuminate words, suggest the magical and interpret the unspoken. A good illustrator can capture the imagination and hearts of not only the audience, but visually interpret the emotions of characters and the adventures they explore. We have the tangible tools of colour, tone, texture and composition at our disposal and the responsibility to capture audible drama, anticipation, and physical emotions. The pause that a ‘page-turn’ gives offers an illustrator infinite possibilities. I love the idea that nothing is impossible to render and breathe life into. It can be quite an overwhelming responsibility and challenge sometimes. Professor McQuark was an amalgamating of many of my historical visual influences: Lego manuals I poured over for hours, and my beloved Richard Scarry (whose books I read as regularly now as in my infant years). Not forgetting Heath Robinson. Many days have been lost in delight fanatically deliberating how his contraptions were created. I loved discovering a 1912 dictionary definition of ‘Heath Robinson-esque’ as an “Absurdly ingenious and impracticable device” Even my children’s love of Wallace and Gromit is a modern embodiment of the same theme. A perfect partnership for Professor McQuark I thought! I love the Science Fair page with all the wacky inventions you have come up with. What is your favourite illustration or spread in the book? I really love diagrams. All those dotted lines, numerical influences, keys explaining odd symbols has me giddy with excitement. Combined with all those Heath Robinson and Richard Scary influences, the science page was a sheer delight. Your description of each object was delicious, just enough to give me a spring-board and leaving just enough to the imagination to create the sublime and the ridiculous. You can never underestimate how magical something ‘plain silly’ can be. The science fair page took me almost 2 weeks to create. I loved every second. 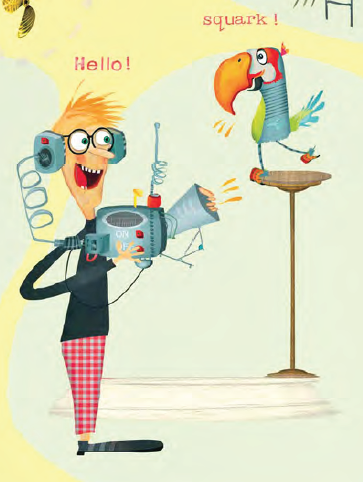 I’d really like the ‘parrot-interpreter-radio’ to be achievable please – I imagine macaws are just hilarious company. And finally… Your latest publication is the Children in Need celebrity co-authored book, The Curious Tale of Fi-Rex. I have to ask: did you get to meet any of the celebrities? Who came up with the best page? Thank you Julia! We will let you return to your woodshed where no doubt new and amazing illustrations are impatient to burst forth! This entry was posted in illustrations, interviews and tagged Julia Patton, Professor McQuark and the Oojamaflip. Bookmark the permalink. I agree with you Julia when you said, “if you can visualize each line, word and character…” It is so important, as a writer, I try to achieve this very feat. It’s a huge art form to write so that the illustrator can envision the story. I adore your illustrations. All the best in your future projects! Thankyou Lily- When I illustrate another authors text it usually is a gently growing process to find the books ‘voice’, but it was instantaneous with the Oojamaflip. This is reasonably rare, which is a testament to the quality of the writing. Great interview, Lou. 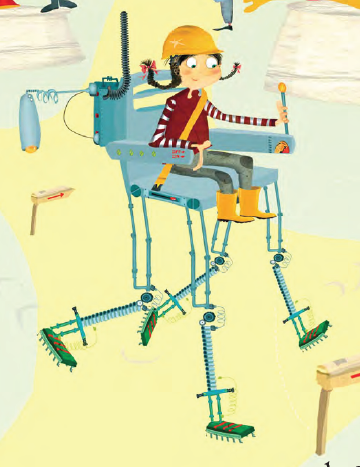 Those illustrations for your book are stunning! I know, I love them! Fascinating, can’t wait to see the whole book!